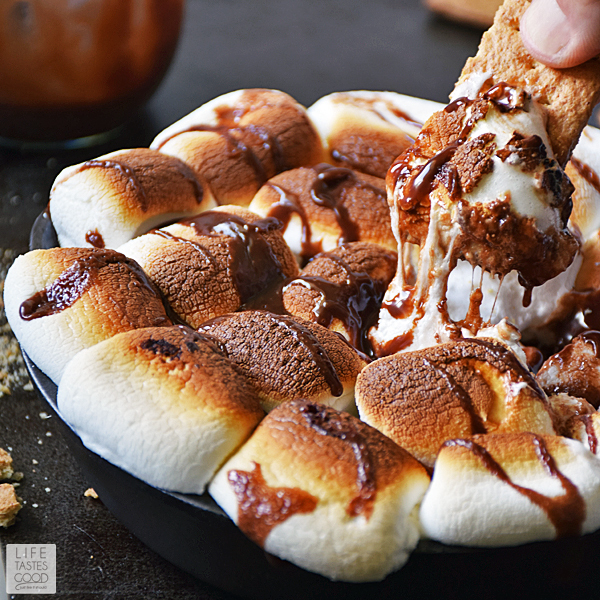 Any day can be a s'mores day with Skillet S'mores Dip! This easy recipe has just 4 ingredients, is made all in one skillet, and ready for dipping in only 5 minutes! It is a fun recipe kids of all ages will enjoy! 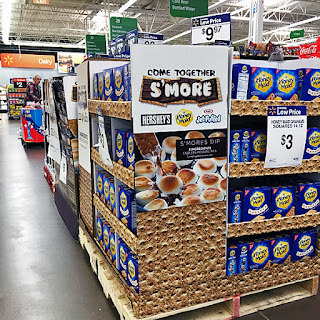 Who doesn't like s'mores? I don't know of anyone! 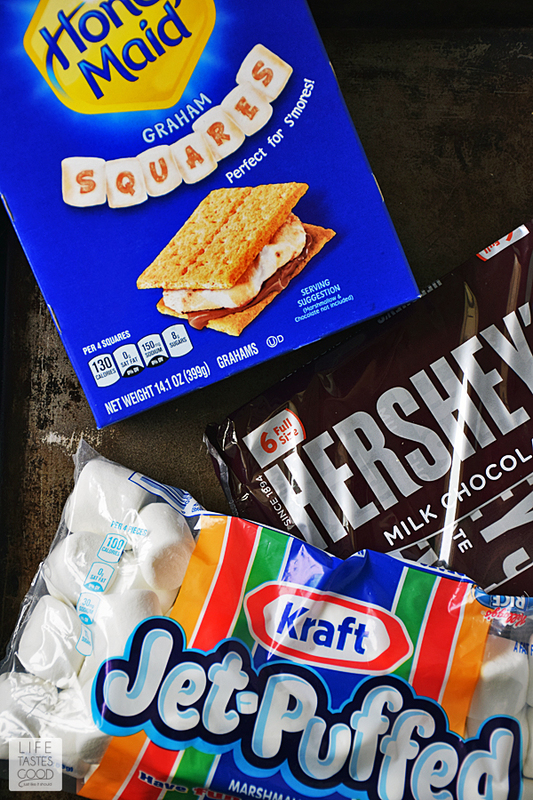 The only problem with s'mores is, traditionally, you need a campfire to make them. 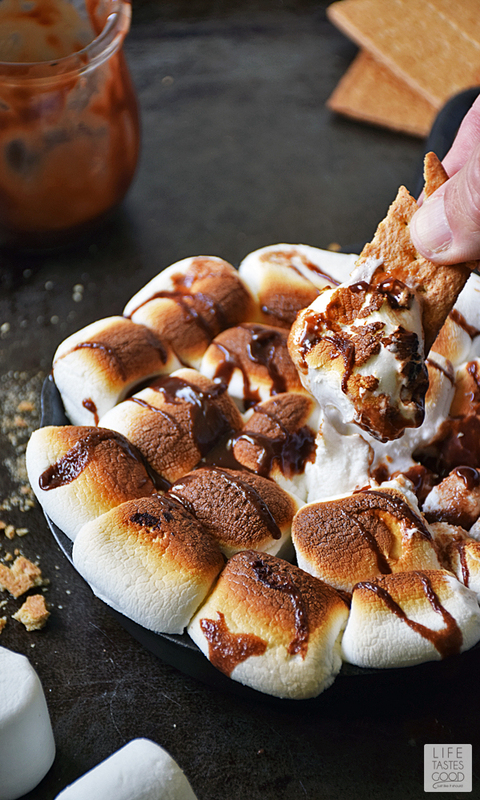 This limits how often you can enjoy the chocolaty, sticky, marshmallow-y deliciousness a s'more offers. That is until now!! 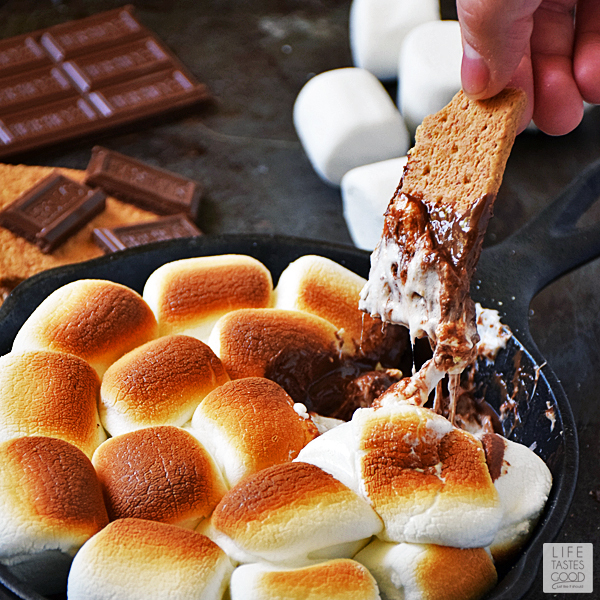 My Skillet S'mores Dip recipe has all the goodness of a traditional s'more, but it's made indoors! 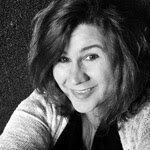 It is quick and easy and can be enjoyed year round! I like that! I layer the ingredients in the skillet and then just put it under the broiler for a minute or two. 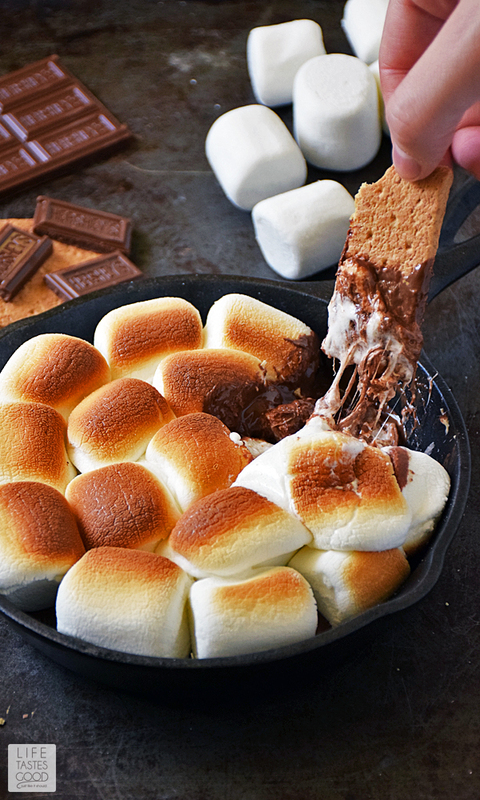 It melts the chocolate and toasts the marshmallows at the same time. I love how the marshmallows get ooey and gooey and still have a crunchy top with that roasted flavor just the way I like 'em! To top it off right, I drizzle on some easy-to-make chocolate ganache! 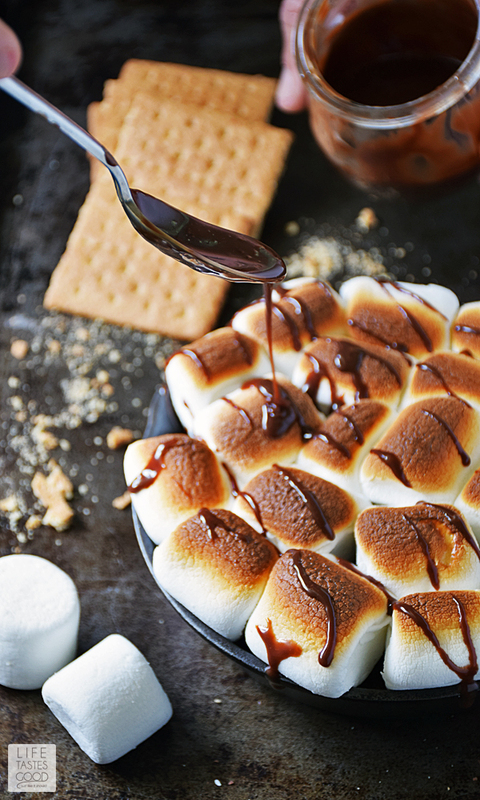 Everyone will swoon over these s'mores! Place the skillet in the oven about 6 inches below the broiler. Broil for about a minute or 2 until the marshmallows are toasted just the way you like 'em. Remember to leave the oven door ajar when broiling and watch them closely. They will burn quickly if you don't keep an eye on them and that would be sad. Once the marshmallows are toasted to your liking, remove them from the oven and drizzle with creamy, rich chocolate ganache! Now it's ready to dig in with Honey Maid Graham Cracker Squares. Enjoy!! Preheat the broiler on high. Unwrap 3 Hershey's Milk Chocolate bars and break them into the little individual pieces. Layer them in a 6" skillet. 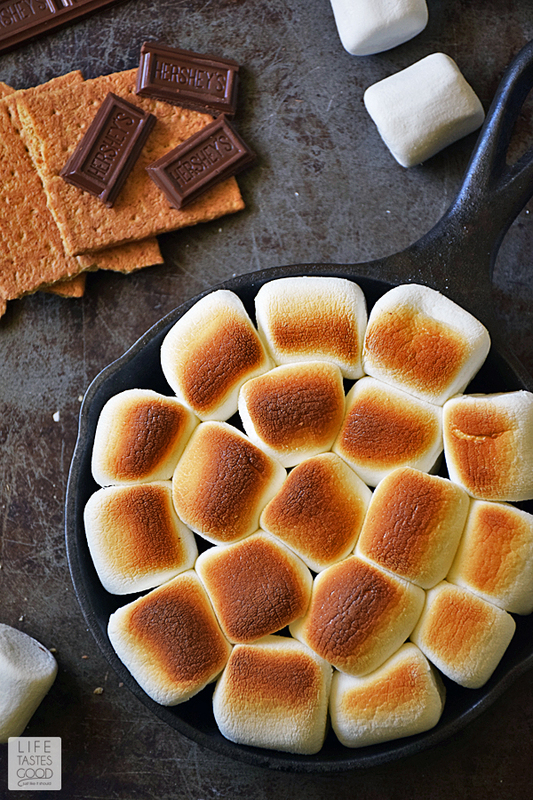 Top the chocolate pieces with Kraft's Jet Puffed Marshmallows to fill the skillet. I used 18 marshmallows and started on the outside and worked to the center until the skillet was full. Using the remaining chocolate bar, break it into pieces and place in a microwave-safe bowl. Add 1 tablespoon heavy cream and microwave for 30 seconds on high. 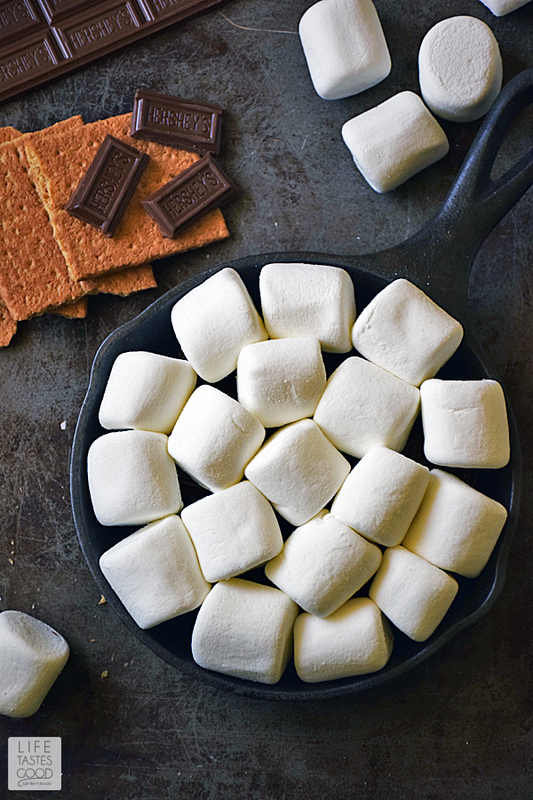 Stir to combine and drizzle on s'mores. If the ganache is too thick, add more cream as needed to achieve desired consistency. Enjoy!